Difficulty Notes: No major difficulties other than catching a bus or walking up the approach road 11 km. 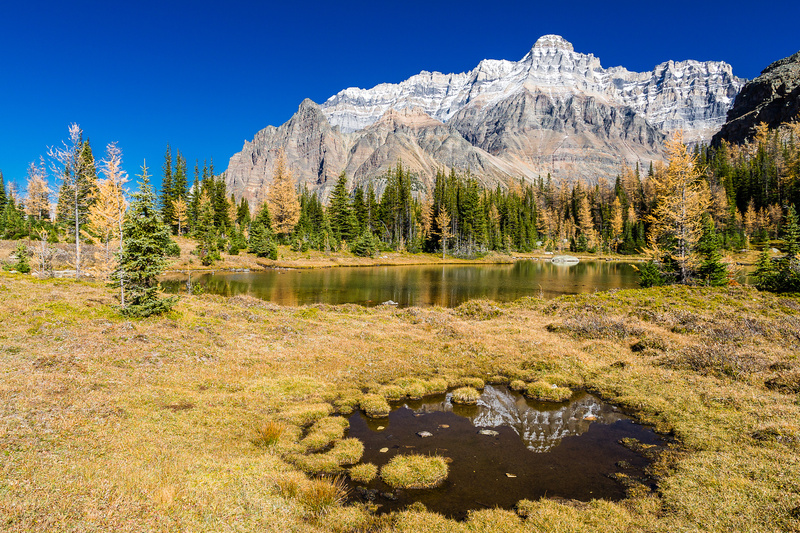 Fall is the best time to hike this circuit. 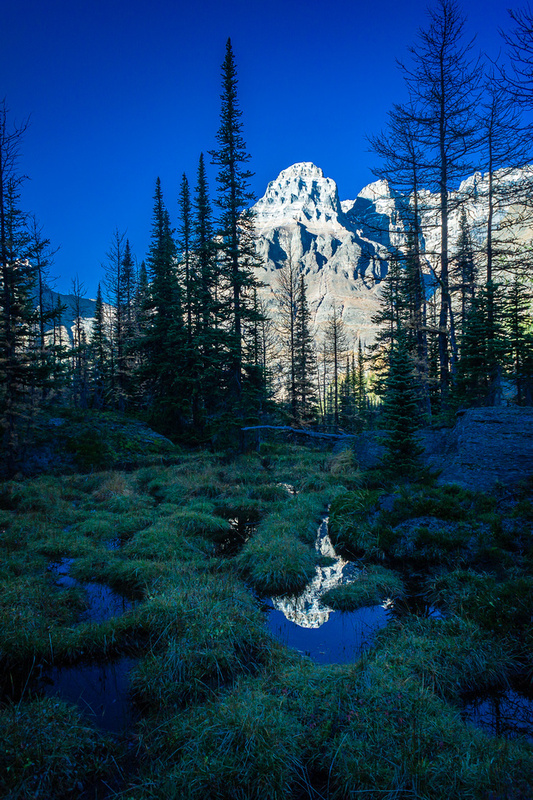 As part of a peaceful and relaxing solo hiking trip to the Lake O’Hara region in 2010, I scrambled up Mount Schaffer early in the day on the 30th of September in perfect weather conditions. After checking out McArthur Lake (stunning) I had the rest of the day to explore part of the so-called Lake O’Hara Alpine Circuit, a gorgeous series of trails staring near the Lake O’Hara lodge and working its way up past Mary and Moor Lakes to Hungabee and Opabin Lakes before looping back around the upper Opabin Plateau and along Yukness Mountain’s south and west flank towards Lake Oesa. 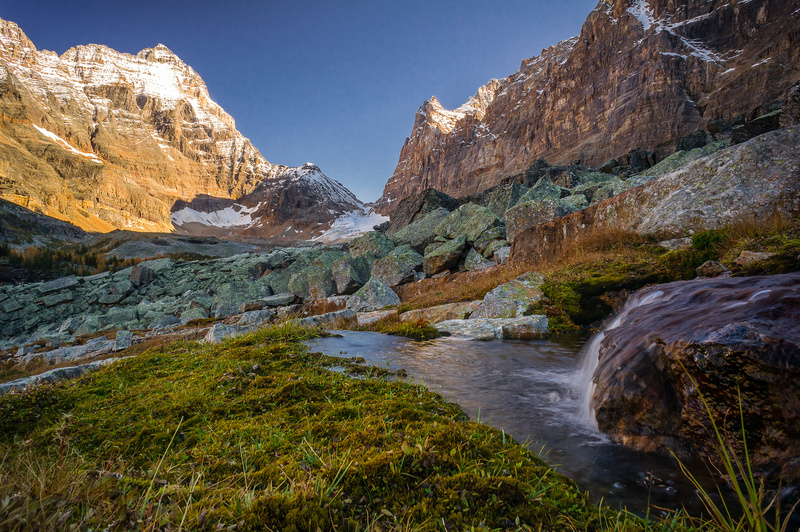 From Oesa the route traverses under the south face of Mount Huber and back down to Lake O’Hara from the Wiwaxy / Huber col, finally ending again at the lodge, or the Elizabeth Parker ACC Hut where I was staying for a few nights. 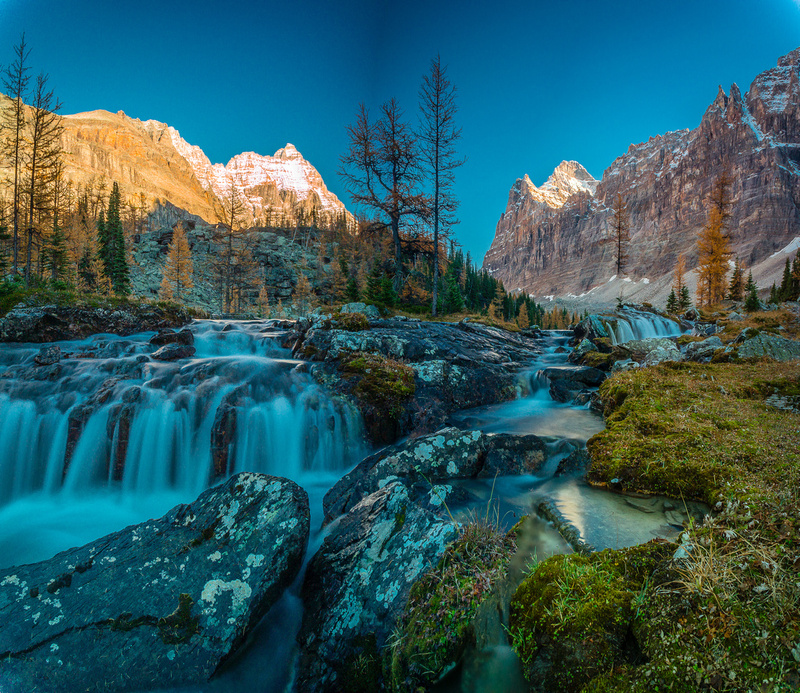 For the first day, since I had already done Schaffer Mountain and McArthur Lake, I was going to only do the All Souls Prospect and part of the Opabin Plateau circuit. 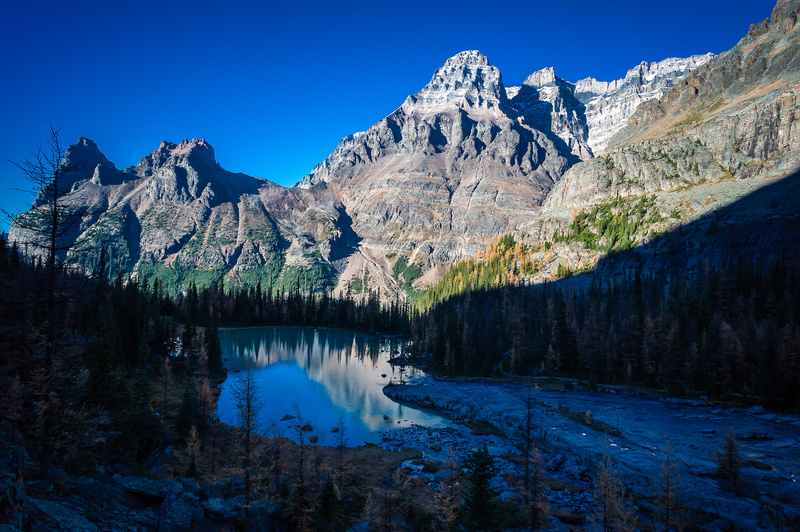 The following day I would go back to Opabin Pass at the extreme eastern edge of the Lake O’Hara region before coming back around the Alpine Circuit near Lake Oesa and finishing with a scramble of Wiwaxy Peak – East. 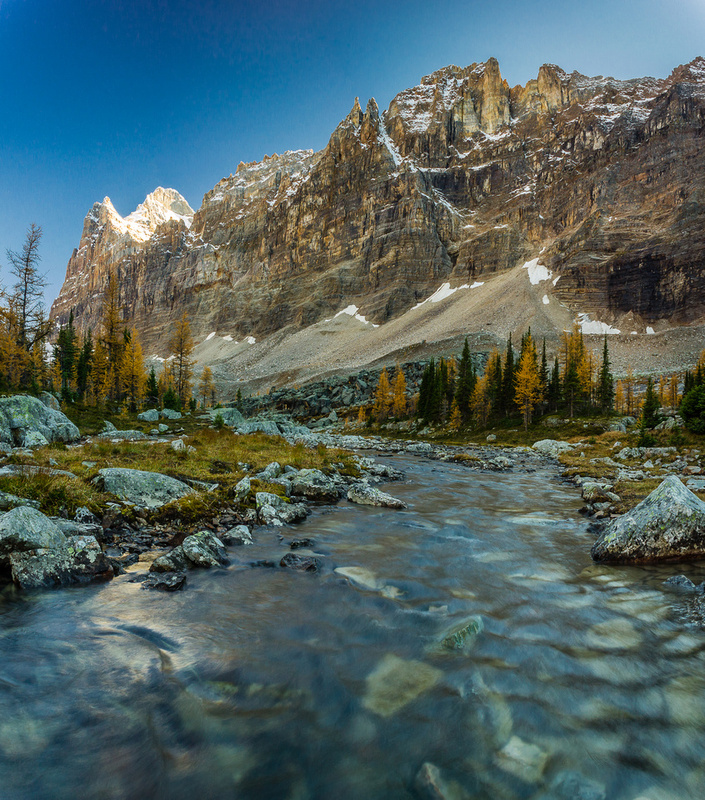 It was around mid day when I got back from McArthur Lake and started the steep grunt up All Souls Prospect from near the lovely Schaffer Lake which sits between Mount Schaffer and Mount Odaray. The trail is well marked and obvious to the summit of All Souls. 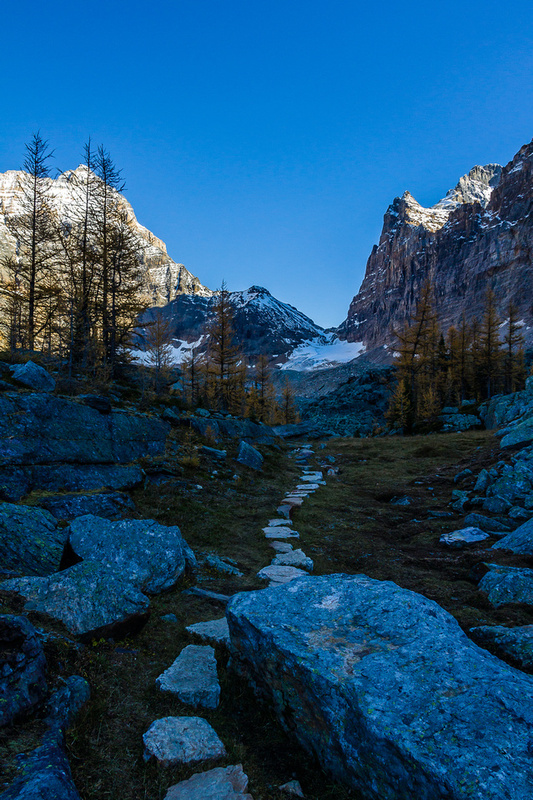 Being an alpine route, it is a fairly steep grunt with minor exposure in places. 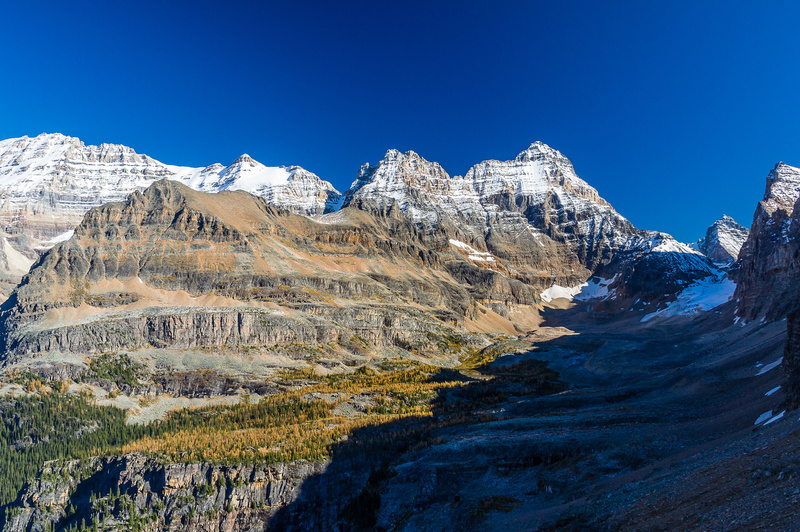 Once I started getting above tree line the views of the Lake O’Hara region were stunning in every direction. 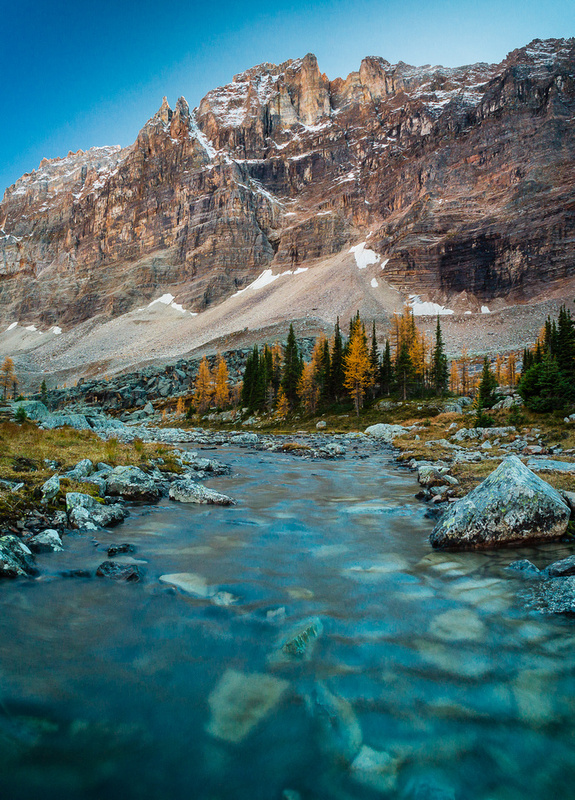 The crisp, clean and clear fall air conspired with the warm sun and sublime mountain views to give me one of the absolute best hiking experiences of my life. A very special day that will never leave me as long as I have memories. 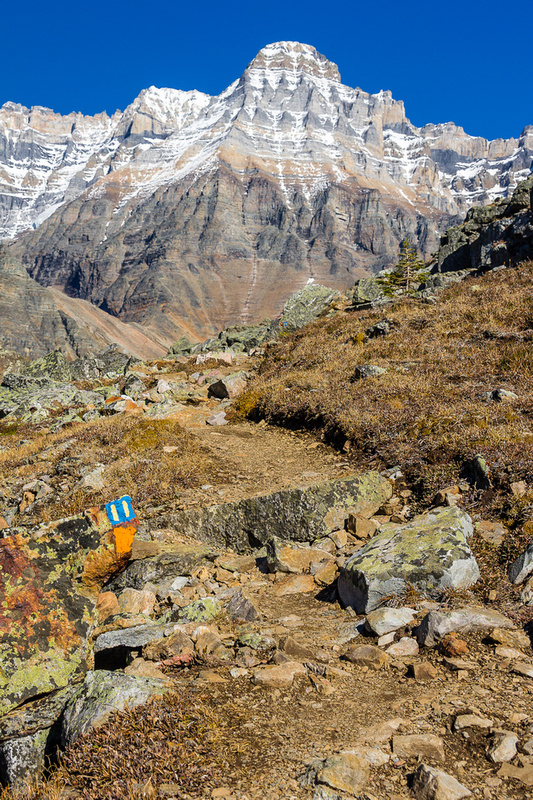 In the Lake O’Hara region, you know you’re on an ‘alpine’ route when there are markings like this on the trail. 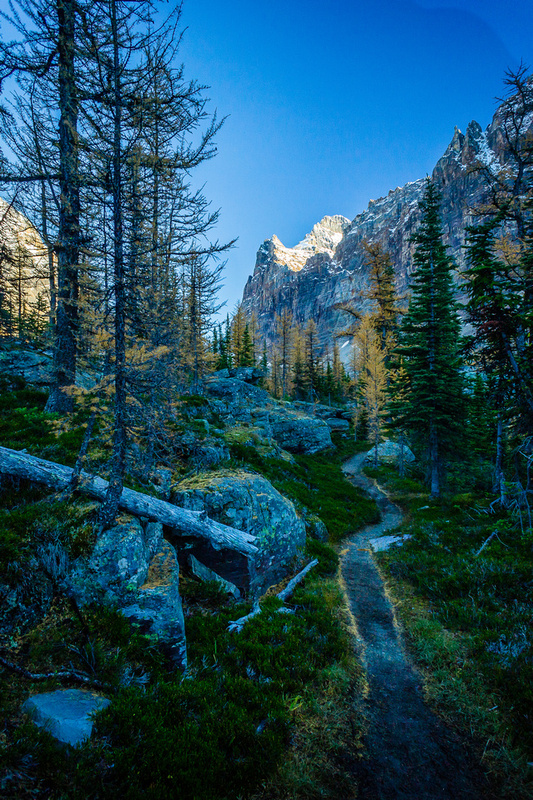 You will not find better maintained or positioned trails anywhere in the Rockies. Mount Huber rising dramatically in the distance. One of my absolute favorite views from the entire day. 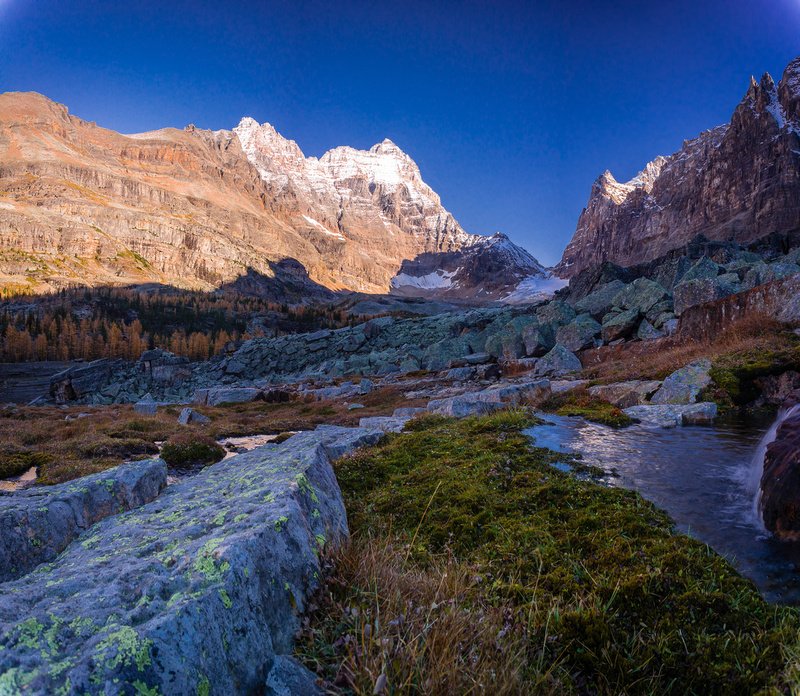 From L to R, Mount Owen, Schaffer Lake, Walter Feuz, Odaray, Steven and Cathedral. 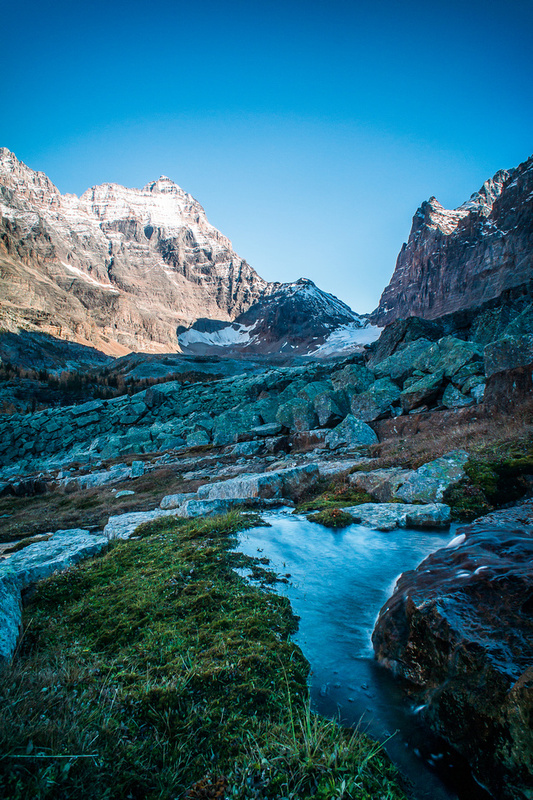 Views over the core Lake O’Hara region include (L to R), Walter Feuz, Odaray, Stephen, Cathedral, Wiwaxy, Victoria, Huber, Lefroy, Glacier, Yukness, Ringrose and Hungabee. 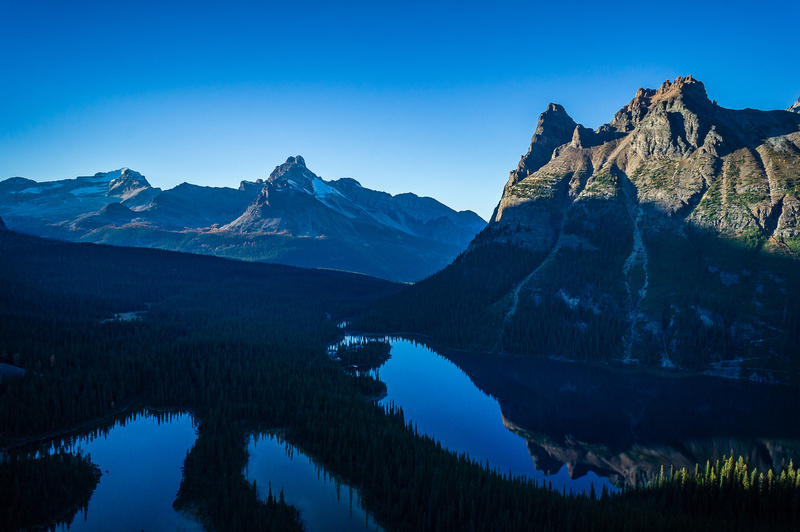 Schaffer Lake at lower left, Lake O’Hara at center and the Opabin Plateau at right. 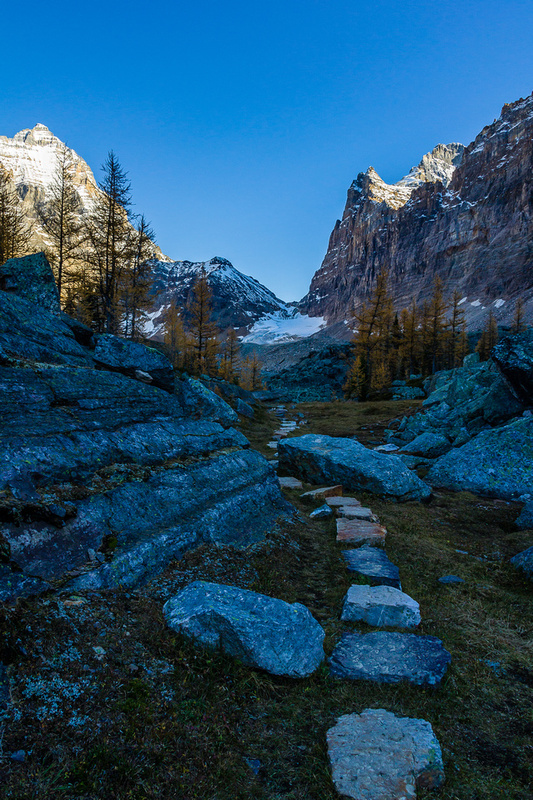 It was tough to leave the beautiful summit of All Souls, but there was a lot of hiking and exploring left for me to do before dark so I started down the scree trail towards the Opabin Plateau far below. 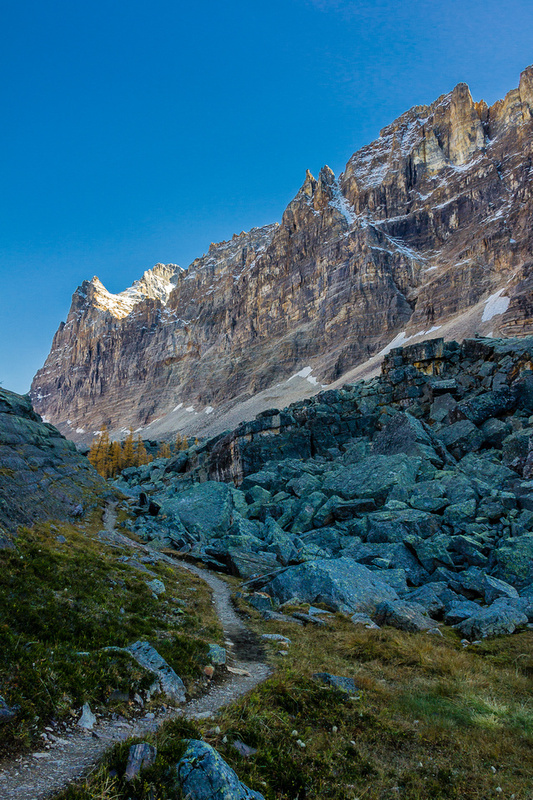 This trail is the most rugged part of the Lake O’Hara Circuit. I would recommend doing the circuit in the same direction I did, simply because you’ll take advantage of good lighting in the morning and you’ll descend the loose scree rather than grunt up it. 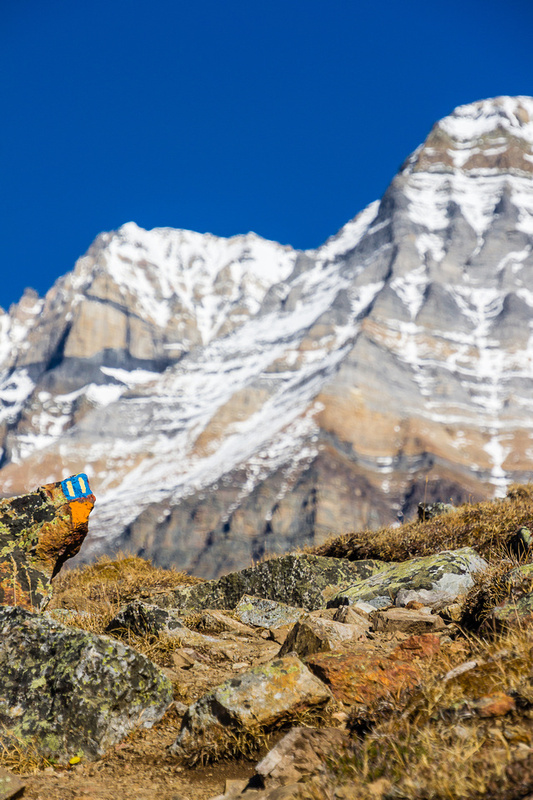 Hikers not used to the alpine might find this section a bit unnerving – hiking poles will help your confidence immensely! 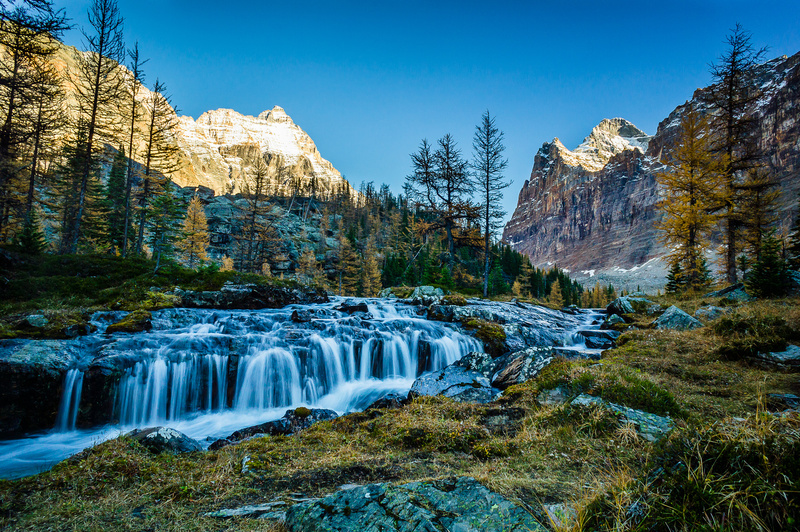 The Opabin Plateau has many hidden gems. 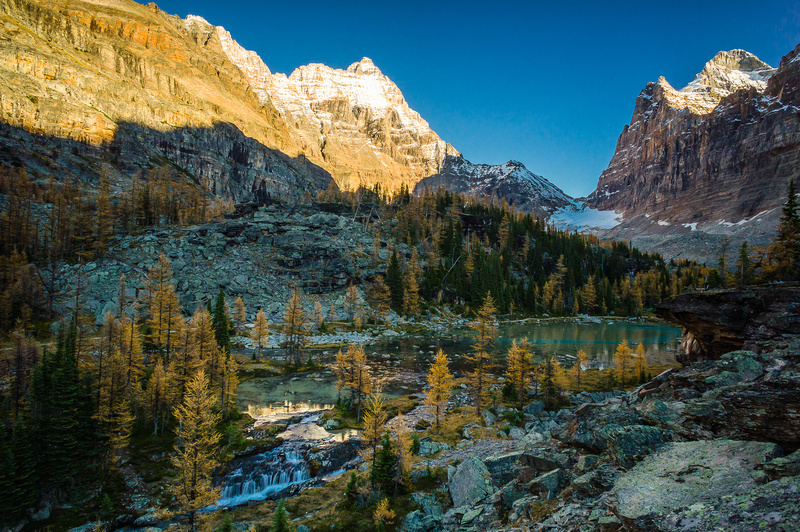 The network of trails first built by Lawrence Grassi in the Lake O’Hara region are amazing. There are some options when descending to the Opabin Plateau. 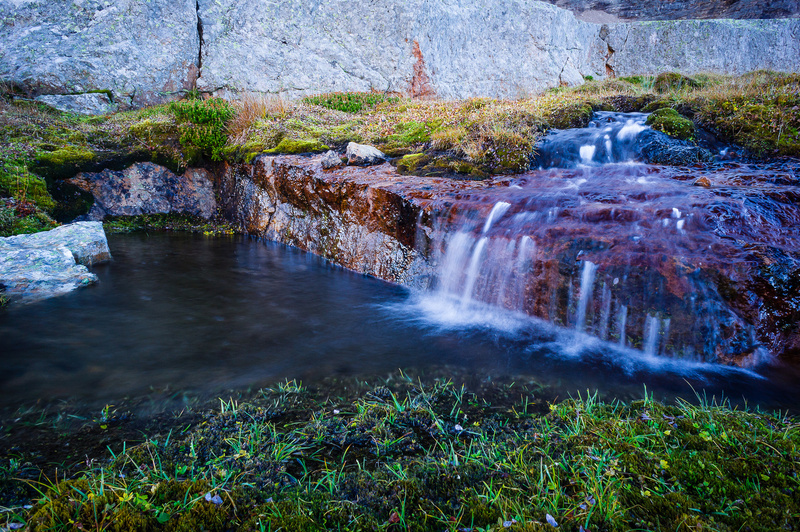 I choose some off-trail hiking near some nice running water and small falls in order to take late afternoon / evening photographs. 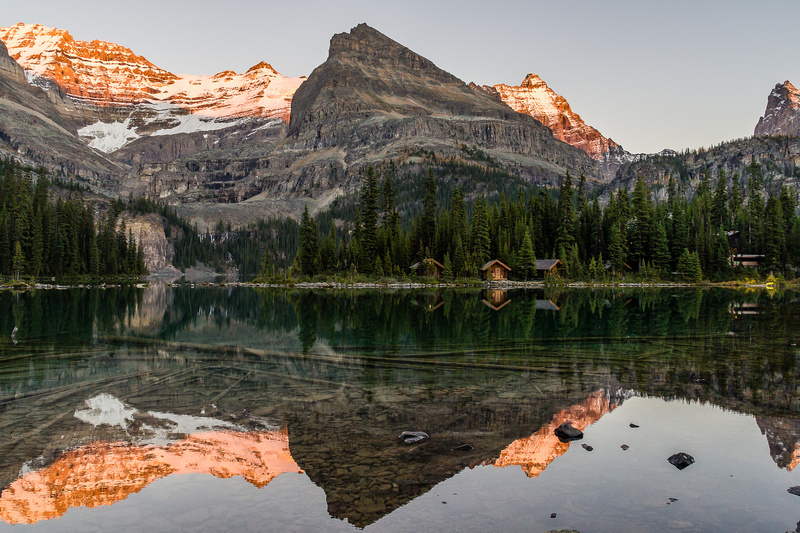 Huber, Lefroy, Yukness, Hungabee and Biddle reflect in Lake O’Hara. 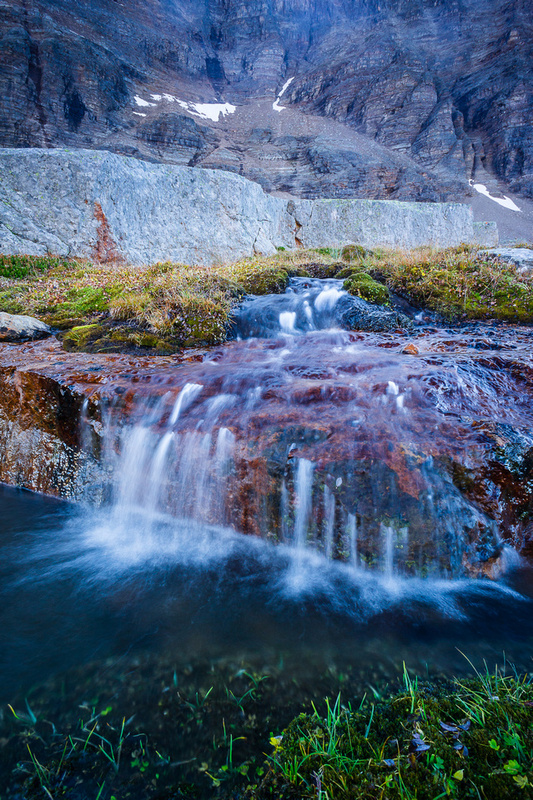 I also chose to hike past the lovely Cascade and Moor Lakes before descending to Lake O’Hara and walking the shoreline in growing darkness. 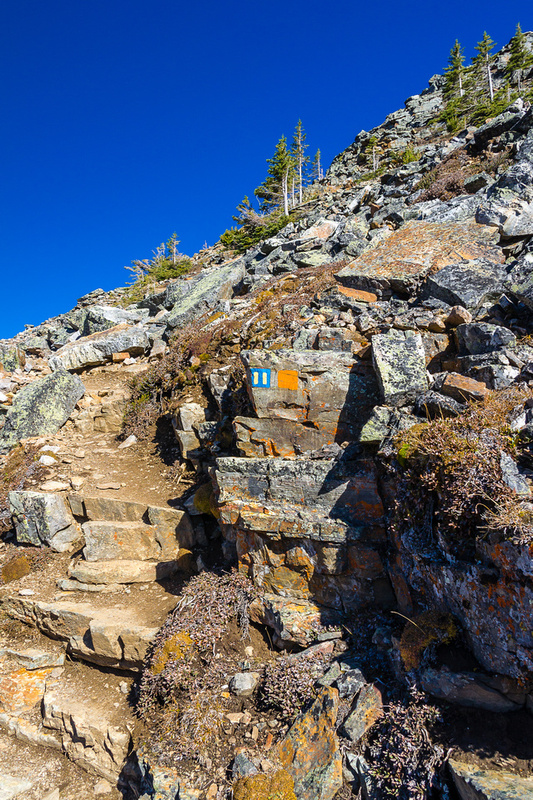 In the Lake O'Hara region, you know you're on an 'alpine' route when there are markings like this on the trail. The route is easy to follow with a great trail and clear markings painted next to older orange square ones. One of my absolute favorite views from the entire day. 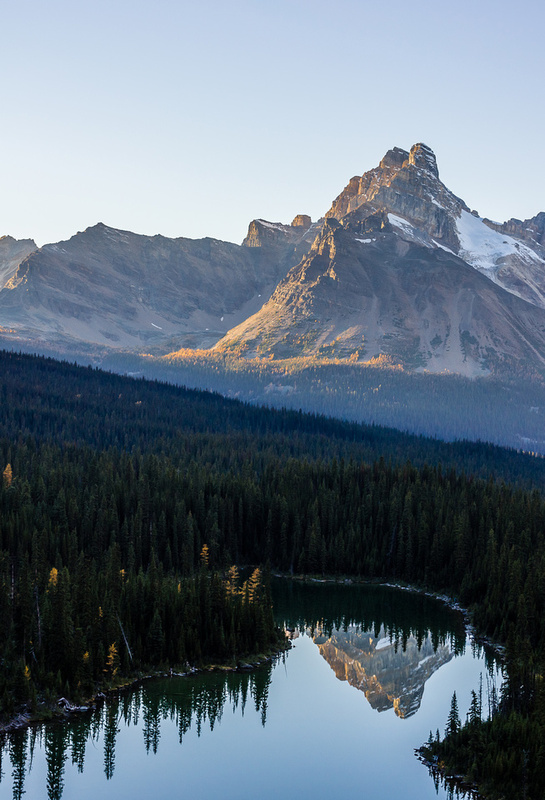 From L to R, Mount Owen, Schaffer Lake, Odaray, Steven and Cathedral. Mount Huber looms over the All Souls Prospect trail. From L to R, Odaray, Stephen, Cathedral, Wiwaxy, Victoria, Huber, Lefroy, Yukness, Ringrose, Hungabee, Tuzo and Biddle. The Opabin Plateau is where I'll go the next day and is also part of the O'Hara Alpine Hiking Circuit. 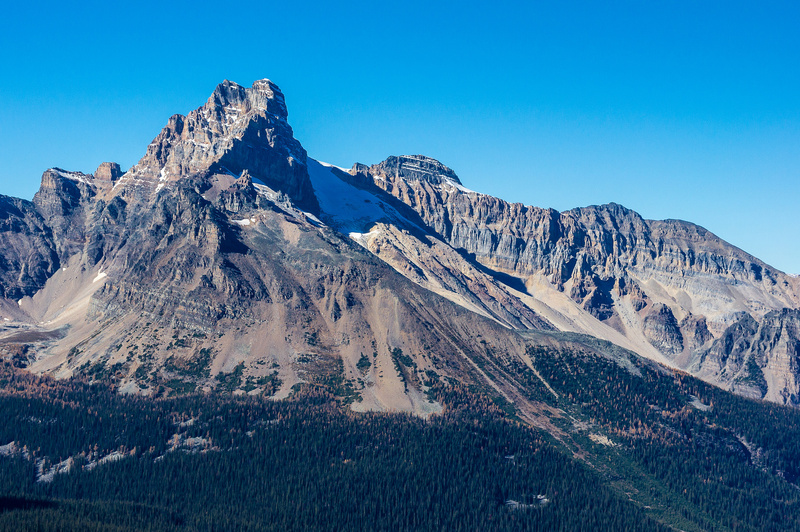 Cathedral Mountain is one of the sexiest peaks I've had the pleasure of climbing. Vern on the summit of All Souls. I had to hike off the main trail to find this scenery - still above the plateau under the north face of Schaffer / Biddle. 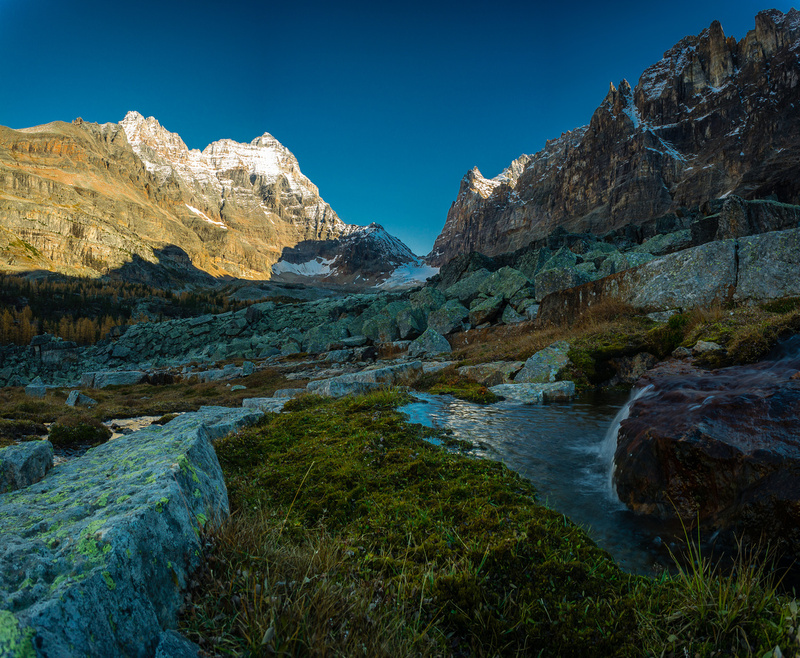 Later afternoon light is challenging on the Opabin Plateau thanks to bright white snow / glaciers above and deep, cool shadows in the valleys. I felt like I was on another planet most of the time during my hike. 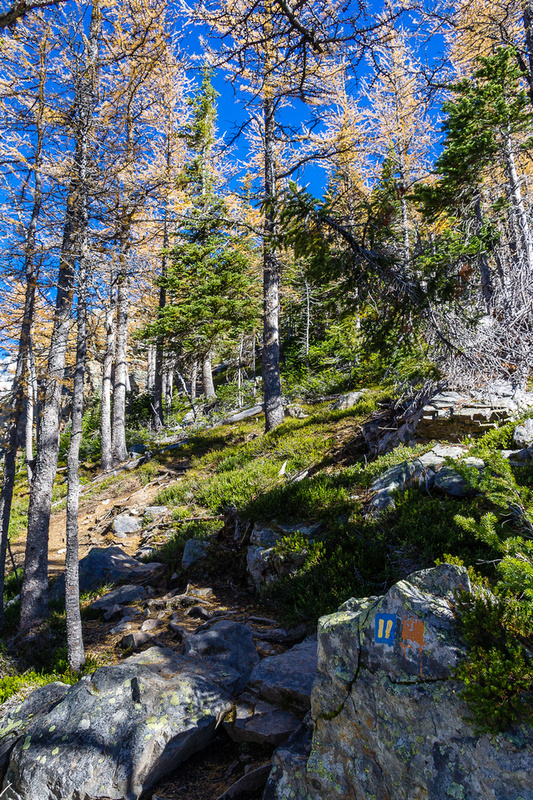 Larch needles line the perfect trail. 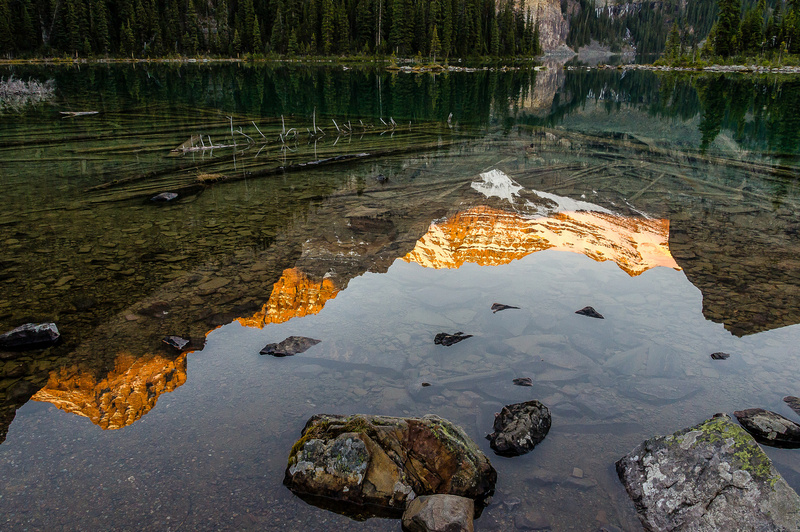 Cathedral reflects in Mary Lake in this view looking down from the Opabin Plateau. 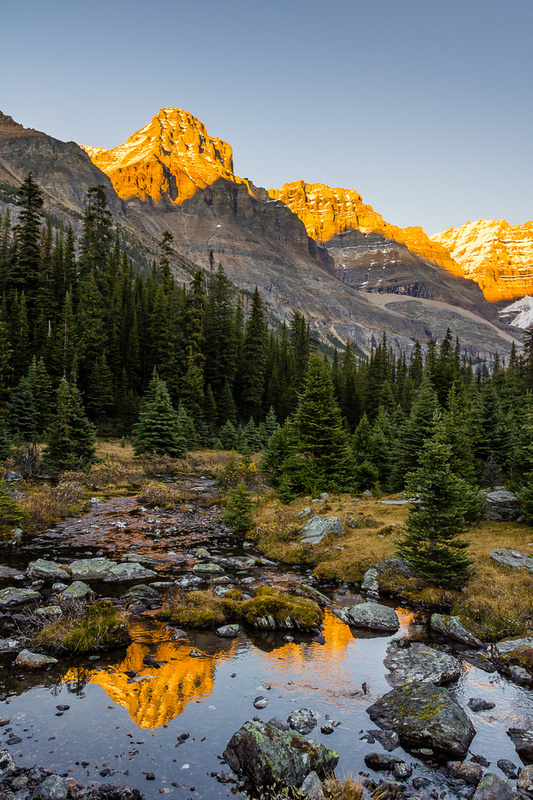 A gorgeous sunset with Mount Huber reflecting in a stream to end my visually overloaded day. 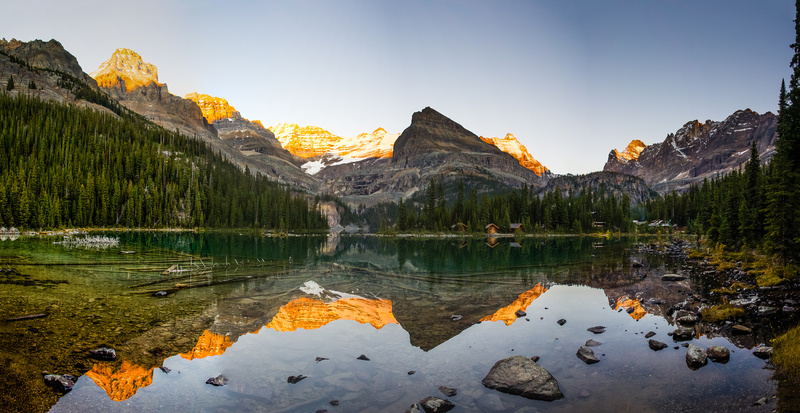 Huber, Lefroy, Yukness, Hungabee and Biddle reflect in Lake O'Hara. Last look before heading back to a warm, cozy Elizabeth Parker hut for supper.